Sleep Disorders Part 1 offers a glimpse of developments that focus on diagnostic techniques in the field of neurobiology of sleep. This part discusses the models of the rapid eye movement (REM) sleep mechanism; issues regarding sleep states, stages, and memory consolidation; and advances in the understanding of the sleep-wake genes, gene products, the circadian clock, and the role of sleep duration. This book explains noninvasive neuroimaging studies, particularly positron emission tomographic and single photon emission computed tomographic scans. 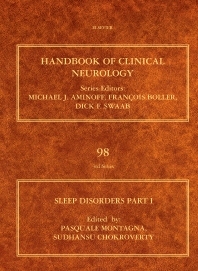 It further discusses advances in clinical science, including concepts about neurobiology of sleep, narcolepsy-cataplexy, therapy, and laboratory techniques. The significant advances in therapy have led to the addition of new drugs for the treatment of different sleeping disorders, as described in this book. Sleep is essential to humans. Awareness of its true importance leads to the development and acceptance of sleep medicines in the market.